Antonia DePaulis first appears in the Painesville, Ohio, area in 1925. In America, Antonia DePaulis was known by her married name, Antonia Lucrezi. Antonia DePaulis was born on March 28, 1904, at Fontecchio, Italy. She married Marco Lucrezi, son of Pasquale Lucrezi, about 1925, in Italy. Marco had a child (Anthony, age 4) when he married Antonia. 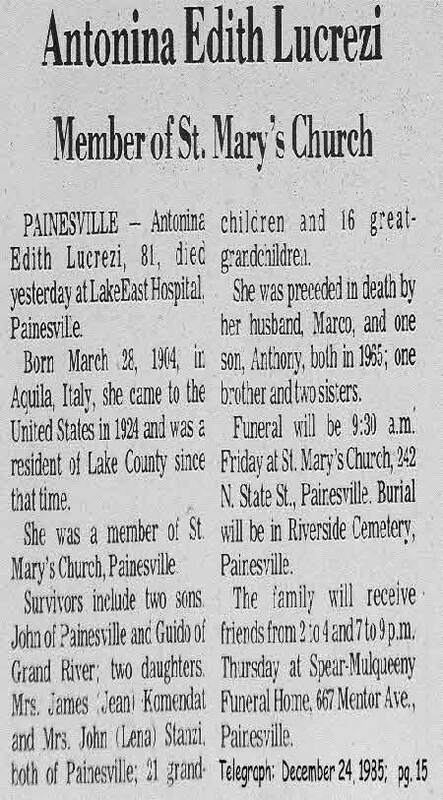 Antonia died on December 23, 1985, at LakeEast Hospital, Painesville, Lake County, Ohio, at age 81. Her body was interred at Riverside Cemetery at Painesville, Lake County, Ohio. Antonia DePaulis, age 21, immigrated to the United States on June 13, 1925, travelling to Fairport Harbor, Lake County, Ohio. She was accompanied by her husband, Marco Lucrezi. Marco was returning to Fairport. Antonia DePaulis Lucrezi became a citizen of the United States on February 3, 1944. Antonia resided at 700 North St. Clair Street, Painesville, Lake County, Ohio, when she was naturalized.